I tried folks. I went across the entire country and I found only one craft store. And it was for quilting. Nothing against that kind of sport, but I was searching for yarn. And yarn like sports such as knitting. 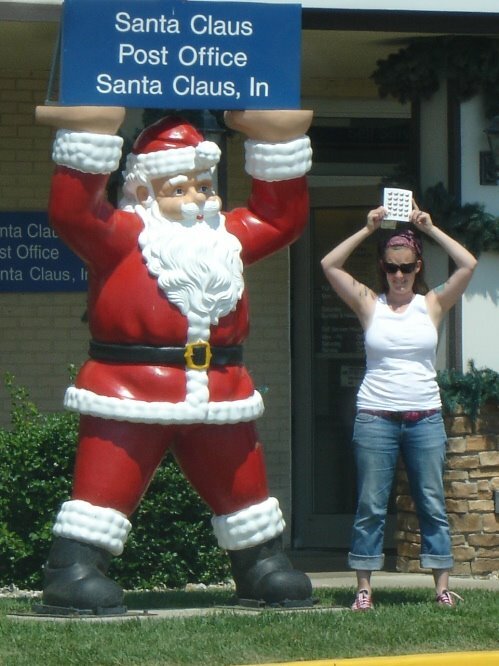 That would be me and Santa. But don't tell anyone - he wasn't real. Phew, I had to get that off my chest. I am so glad you are coming back! I have been waiting for you to get your gift. I am working on another collection now as well. Any requests from the Seattle Area? I could go all generic and pick something up at Starbucks? Oh maybe something Sonics as they won't be Seattle anymore? (I really don't care my husband is VERY upset). Looks like a fun trip!!! Isn't it amazing ... all of the little tiny towns and wide open space between here and the other coast???? Fun!! !